Jazz guitarist George Benson was one of the first artists who received a Ibanez signature model on his own terms. When the GB-10 model was introduced in 1978, it was a real sensation, such a handy and great sounding jazz guitar had previously never built. The current GB10SE-BS guitar from Ibanez Signature series follows this tradition. 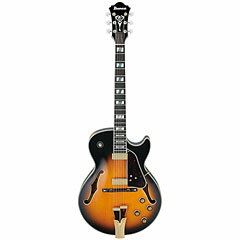 The reduced body is made of locked maple and is provided with a spruce top. 2 IBZ Minihumbucker provide their own warm, rich with presence tone. As with the original GB guitar, the GB10SE has the then usual with Ibanez Half and Half (combination of bone and brass) saddle. The Signature series comprises of various Ibanez models that were adapted to the needs of the artist by using more or less extensive modifications correspondingly. The basic idea of a Signature guitar is that the artist in question can replace "his" guitar if necessary almost anywhere and on the other hand, the inclined guitarist can play the same model as his idol. Many features of Signature guitars have now found their way into series production.